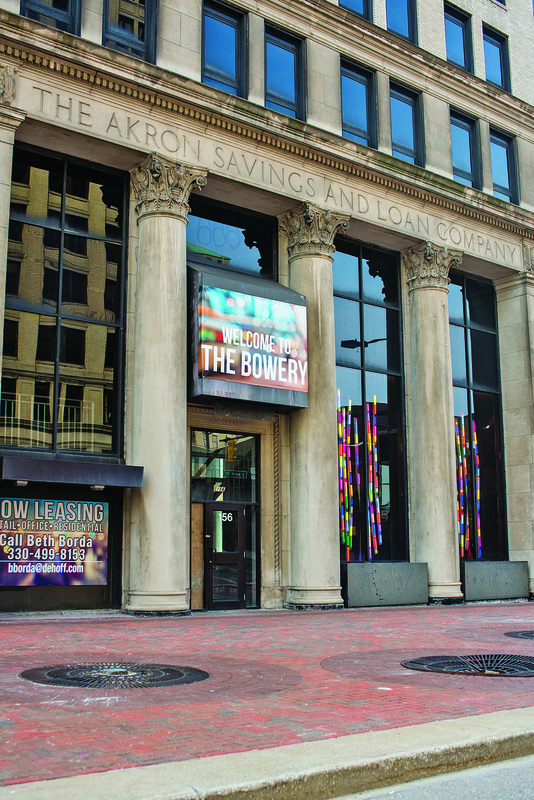 Crain’s Cleveland Business – July 14, 2018 – Cleveland, Ohio – For Akron to continue its downtown revival, it will need some help — capital, programs to incentivize investment, a sustained healthy economy and a continued appetite for downtown living. But that’s a far cry from the not-too-distant past, when many would have said that the city needed a miracle. What’s more, many of the Rubber City’s current needs are being met or about to be addressed, including with a new investment fund aimed squarely at Akron. That last bit of assistance is coming from Don Taylor, CEO of Fairlawn-based Welty Building Co. (probably the largest construction company in Greater Akron) and past chair of the Greater Akron Chamber. Overhead view of downtown Akron. Taylor said he’s bringing a longtime goal to fruition this summer by unveiling a new investment firm that will operate a $20 million to $30 million mezzanine fund — which could provide a combination of debt and equity financing that would help facilitate bank lending — to invest in Akron developments. “I’ve spent a significant amount of time putting this together over the last several months, and we’re going to launch a company … Catalytic Community Capital,” Taylor said. Its mission, he said, will be to provide developers the last bit of financing they need to finish the capital stack necessary to complete projects in Akron. “We would actually invest in kind of a mezzanine fund to help people who are just stuck,” Taylor said. In a sense, Taylor is investing in his own business as well because Welty is likely to be involved in future projects in and around downtown Akron. Welty already is working on projects such as the Stark State Akron campus along state Route 8 and is preparing to start work on the city’s crucial Bowery Project later this year. Taylor, through his work with the chamber and other efforts, intimately knows the plans of city officials and entities like the Downtown Akron Partnership. They have set out visions for downtown that the city and developers now seek to fulfill. And he’s seen many plans often take longer than necessary as projects stall or go by the wayside. He thinks his new venture will help. “We think helping the capital stack is going to be a huge benefit to the city in activating some of these plans they have for downtown Akron,” Taylor said. Taylor said he’s been working with wealthy area families, individuals and other potential investors. He thinks he has the group he needs to launch.”There’s more to come on that in the next month or six weeks,” he promised during a June 27 interview. If he pulls it off, city officials will be thrilled. 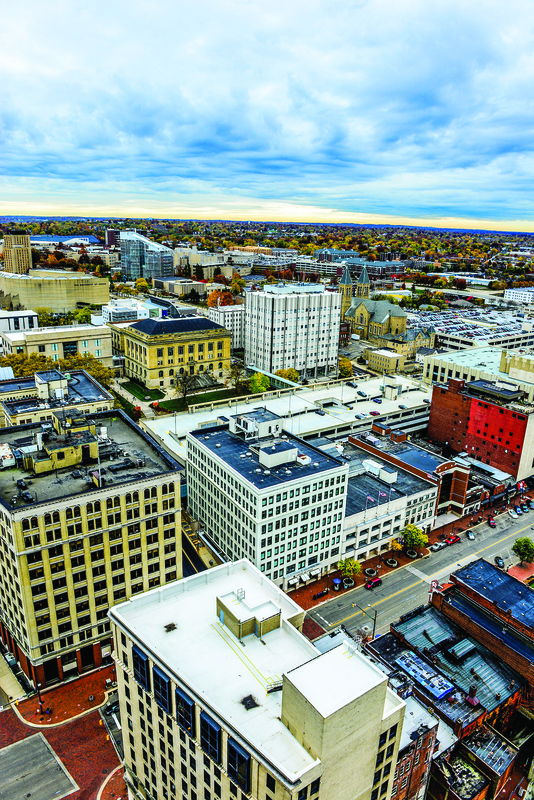 “That would be amazing … the biggest thing that downtown Akron needs, always, is more capital,” said James Hardy, chief of staff to mayor Dan Horrigan and the administration’s point man on many downtown development issues. Chris Burnham, president of Development Finance Authority of Summit County and possibly the one person who works the most on financing local development, also was enthused. “He’s been talking about, conceptually, some things like that for a while, so that’s good to hear. That would be great,” Burnham said. They and others would especially welcome something like a mezzanine fund because Akron has a lot of pent-up demand for projects and developers anxious to start them, but financing has gotten more challenging recently. Lenders are requiring more money be put into a deal before they’ll lend the rest, according to Burnham, Taylor and others. “It used to be you could borrow money on an 80/20 basis. You put 20% down and could borrow 80%. Now it’s more like 70/30,” Taylor said. His fund would address that gap. Until now, finding a source of financing or investment to bridge the gap has been difficult and sometimes impossible, Burnham said. “There are no capital funds and REITs looking to invest in a place like Akron. It’s just a fact,” Burnham said. Such a fund also would come at a time when Akron has a lot of its other boxes checked off in terms of what the city needs to continue its recent spate of development. 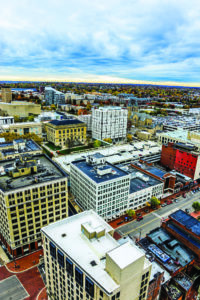 For example, the federal government has approved “opportunity zones” for sections of Akron, including downtown, that will enable investors to improve properties without having to pay capital gains on the increased value of their holdings, Burnham said. The city intends to use them to their fullest extent, Hardy said. It’s just waiting for more details from the U.S. Treasury Department, which oversees the program. 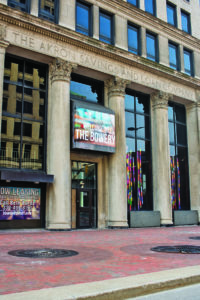 Akron has been disappointed before, including this past spring when the Bowery Project was denied New Market Tax Credits, so Hardy is cautious. “In theory, (the opportunity zones) sound really exciting and catalytic, but until the rules are set up and people start making investments, it’s still a little bit of a question mark,” he said. But watchers say the city already has a lot of things in place that should help sustain the pace of development. Chief among them is a 15-year tax abatement that the city enacted in 2017, allowing homeowners and developers alike to invest in residential property without adding to their local property tax liabilities. Those behind the Bowery Project, the conversion of the Law Building to residences and the conversion of the City Center Hotel to market-rate apartments all say the abatement is an important part of their financing. The city also is providing the right type of infrastructure for local developments to succeed, downtown backers say, which is perhaps most evident in the current work to redevelop South Main Street to better facilitate pedestrians, cyclist and livability. More can be done, though, such as creating a community development corporation (CDC) downtown to help the city and folks like the Downtown Akron Partnership plan and execute developments. Hardy said that’s being discussed. “A downtown CDC is a best practice that we don’t currently have in Akron,” he said. “Cleveland has one, Toledo, Columbus, Cincinnati — even Dayton has some sort of downtown development arm that is shielded from political winds. But what the city needs most, watchers say, are two things: for existing developers to deliver on their current projects as promised and sustained demand for downtown housing. On that last point, so far so good. Developers like Dan DeHoff, whose company is leading the Bowery Project, say they’ve been closely watching other developments in town — chief among them, Stuart Lichter’s massive East End development about a mile east of downtown. “He’s full … with a waiting list,” DeHoff noted, adding that Lichter’s success inspired his own confidence in the Bowery Project. As for residents, time will tell how many eventually come, but so far downtown at least seems to be sticky. In other words, at least some of those who live there like it enough to stay, or even upsize. That includes people like Alexandre Marr, a music teacher and employee at American Greetings in Cleveland who has lived in downtown Akron for three years. He spent a year at one of Tony Troppe’s developments off East Market Street before moving to Troppe’s Cascade Lofts two years ago. Now, he and his partner, Dominic Iudiciani, a local photographer, are looking to move again but not out of downtown Akron. That’s only gotten better since they moved in. “Oh, my gosh — exponentially better!” Marr said. He and Iudiciani have a challenge, though. They want to own, and possibly even build, their next home. That might be tough to do downtown, Marr said, but they’re working hard to make that happen. “We love it here. Our preference is to live downtown … We’re rooted here now,” Marr said. Developers seem to have that same feeling. Most of the major ones working downtown are on their second, third and even fourth projects in and around the city’s center. The newcomer is Canton-based DeHoff. He seems to have gotten the long-struggling Project going and said he expects to break ground in September. So, what could go wrong, right? Plenty. Development is generally a risky business on the precipice of turning from boom to bust. Right now, demand is high and the market is easy, but things will tighten. But that doesn’t have to happen soon. The key, developers say, will be to monitor the market and continue to do the things that have increased demand for space downtown. As anyone in Akron, including Taylor, knows — continued success is never guaranteed. Yes, a lot is going the city’s way, but that doesn’t mean anyone should let their guard down, he said. “We haven’t had a burning platform we’ve had to change – the indicators aren’t going in the wrong direction — but if we’re not careful, we’ll miss the next wave of success,” he said.